An important ore of vanadium and a minor source of lead. Vanadinite: A cluster of orangy-brown vanadinite crystals on goethite collected from the Meknes-Tafilalet Region of Morocco. The largest vanadinite crystals are about 8 millimeters across, and the entire specimen is about 4.5 centimeters across. Specimen and photo by Arkenstone / www.iRocks.com. Vanadinite is a mineral composed of vanadium, lead, oxygen, and chlorine. It has a chemical composition of Pb5(VO4)3Cl. It is an important ore of vanadium and a minor source of lead. Vanadinite usually forms where lead minerals are oxidized, often in areas with an arid climate. It is not a common mineral, but it is found in small quantities in many parts of the world. It was given its name because of its vanadium content. Color Usually bright yellow, orange, red or brown. Sometimes gray, black or colorless. Cleavage None. Usually breaks with an uneven or conchoidal fracture. Diagnostic Properties As an ore of lead, vanadinite has a very high specific gravity. Few minerals with this high of a specific gravity have an adamantine or resinous luster. The bright colors of vanadinite can help in its identification. Its crystal habit of short hexagonal prisms is also diagnostic. Vanadinite also occurs as incrustations and as globular masses. Uses An ore of vanadium and a minor source of lead. Vanadinite is popular with mineral collectors because of its bright colors, high luster, and interesting crystal habit. 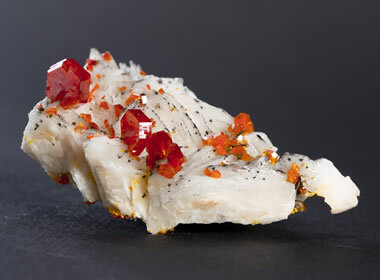 Vanadinite has a number of properties which, when considered together, usually make it easy to identify. It often occurs as brightly colored crystals that are usually short, tabular hexagonal prisms with a resinous to adamantine luster. It is most often bright yellow, orange, red or brown in color. It can also occur in globular forms and incrustations on other minerals. As an ore of lead, vanadinite has a high specific gravity (6.6 to 7.2) and a low hardness (3 to 4 on the Mohs hardness scale). It has a pale yellow to yellowish brown streak and is brittle, easily breaking with an uneven or conchoidal fracture. The crystals can be transparent, translucent or opaque. Vanadinite Crystals: Gemmy vanadinite crystals on a beautiful specimen from Turkey. Image copyright iStockphoto / halock. Vanadinite is almost always a secondary mineral that forms in the oxidized zone above lead deposits. It is often found in oxidized veins containing primary and secondary minerals of lead. It is commonly associated with the oxidation of galena. The vanadium and chlorine are usually leached from the overburden by downward-moving waters. Vanadinite deposits are usually found in arid regions, with notable deposits in Argentina, Australia, Morocco, Namibia, and the southwestern United States. 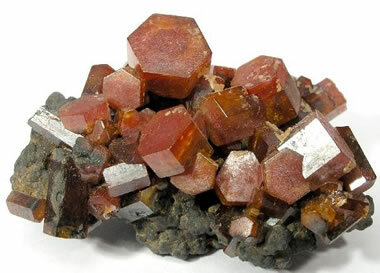 Although the ideal composition for vanadinite is Pb5(VO4)3Cl, phosphorus and arsenic often substitute for vanadium in the mineral’s crystal lattice. This results in a wide range of compositions which influence the specific gravity, color, and other properties. A solid solution series exists between vanadinite and and mimetite Pb5(AsO4)3Cl. Small amounts of calcium, zinc and copper can substitute for lead. Vanadinite, along with carnotite and roscoelite, are important ores of vanadium metal. Vanadinite is also a minor ore of lead. Both vanadium and lead are produced wherever vanadinite is mined. Vanadinite is very popular as a specimen with mineral collectors. They enjoy its bright colors, showy hexagonal crystals, resinous color, and adamantine luster.